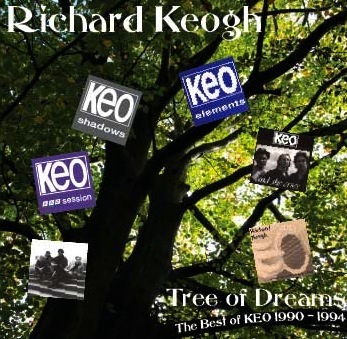 KEO started life as I moved from my first band Dark Edge into a more guitar oriented, rockier sound. For the first album Burning Need, I wrote the songs with Pete Fullard and performed them as a 5 piece. The line up settled down to Rob Fellows – bass, Martin Shaw – drums, Pete Fullard – keyboards, Stewart Elms – guitar and myself singing. I was writing songs on the bass guitar at the time and when the group slimmed down to a three piece, the final line up that recorded the vast majority of these songs was Stewart Elms – guitar (and song co-writer), Earl Roger Robinson – drums/percussion/backing vocals and myself on bass and lead vocals. We travelled down to London to Nightshift Studios and recorded an 11 track demo which became the Shadows album which led to Elements, And She Cries. The original idea was that Elements would be absorbed into the And She Cries album. We also recorded 6 tracks at the BBC Pebble Mill Studios for the John Tainton Show. Although there were a few other demos recorded across the Midlands, this album is a collection from all the above mentioned works along with the live album, Live at the Robin. Interesting as it includes 3 songs not found anywhere else. I trust you’ll enjoy this snapshot of what I was up to then and for those who attend gigs now, you’ll recognise a couple of songs that fit in with my current acoustic focused music.